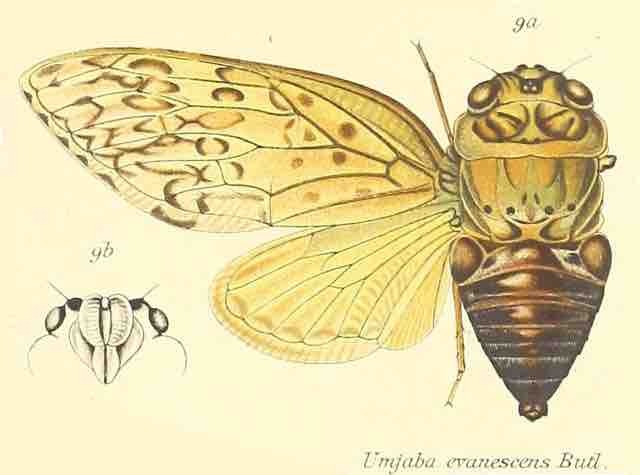 Umjaba evanescens (Butler, 1882) is found in Madagascar. Characters. — Head (including eyes) only about two thirds the width of base of mesonotum, not truncate anteriorly, but obliquely deflected in front of eyes; pronotum transverse, its posterior margin about half the length of its vertex, the lateral margins ampliated, a little angulated anteriorly and posteriorly, but not medially, and not reaching base of basal cell of tegmina; mesonotum slightly longer than pronotum; anterior femora tuberculously angulated near base and apex; posterior tibiae with a few spines on their apical areas; metasternum elevated and centrally sulcate; tympanal coverings broad; opercula short, broad. their apices more or less convexly rounded; rostrum just passing the posterior coxae; tegmina with the costal membrane much arched at base, but very much narrower than the costal area which is broadly dilated, basal cell very broad, ulnar veins widely separated at their bases.